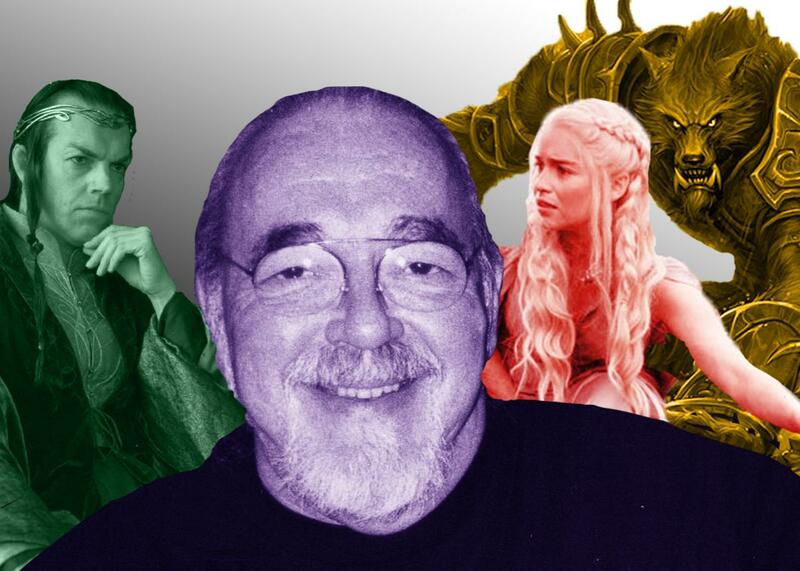 Gary Gygax’s Dungeons & Dragons is a foundational influence on culture in the information age. Go ahead, mock. But Dungeons & Dragons created the cultural building blocks of our information age. Photo illustration by Sofya Levina. Images courtesy of Moroboshi/Wikimedia Commons, New Line Productions Inc., HBO, and SobControllers/Flickr. Excerpted from Empire of Imagination: Gary Gygax and the Birth of Dungeons & Dragons by Michael Witwer. Out now from Bloomsbury. Dungeons & Dragons changed the world, but in ways far more abstract than video games and computer technologies. Although it is debatable whether D&D ever became a thoroughly mainstream activity, as a 1983 New York Times article had speculated, referring to it as “the great game of the 1980s,” D&D and its role-playing game derivatives are beloved by a relatively small but dedicated group of individuals, affectionately (and proudly) known as geeks. Although the term geek is not exclusive to role-playing gamers, the activities of this particular community have often been viewed as the most archetypal form of geekiness. Labels aside, what is notable is that the activities of this RPG audience were highly correlated with interests in other activities such as early computers, digital technologies, visual effects, and the performing arts. In this way, the game assembled and inspired this early group of geeks, though small in number, who became the computer programmers, fantasy writers, video game designers, and film stars of today—the leaders and masters of the information age. If you have ever played a first-person shooter video game like Call of Duty, a massively multiplayer online role-playing game like World of Warcraft, or a computer role-playing game like Final Fantasy; if you have ever logged on to an online virtual world like Second Life or experienced the wildly popular Game of Thrones television series and books, then you are already tangentially familiar with Dungeons & Dragons. Simply put, this seminal game made these later multibillion-dollar pop culture phenomena possible. D&D helped establish our dominant cultural moment: We live in an era when it is chic to be geek. First distributed in 1974, D&D effectively created the role-playing-game industry—clear-cut D&D derivative games, and in fact all RPGs, came from this influential work. Everything from the successful Traveller and Call of Cthulhu RPGs to Vampire: The Masquerade, Pathfinder, Dungeons & Dragons 5th Edition, and numerous others were either directly or indirectly inspired by the advent of D&D. “There’s a reason why nearly every big-name American game designer will cite D&D as a formative influence,” wrote D&D 5th Edition co-designer Rodney Thompson, “because the principles of D&D help form the foundation upon which modern game design is built.” By the end of the 1970s, dozens of RPG and related gaming companies had opened their doors, and today there are hundreds. D&D inspired and enabled the people who started these companies, all individuals who were once recreational gamers and enthusiasts, to take their interest to the next level. This not only triggered a virtual flood of ideas and creativity in the gaming world but, from a pragmatic standpoint, also created jobs and opportunities for many others. Beginning as simple D&D-inspired text-based adventure games like Zork, early programmers used these concepts to create some of the earliest online games and communities, called multiuser dungeons. These adventure games, and their online adaptations, are the acknowledged ancestors of titles like Might and Magic, Final Fantasy, Diablo, The Elder Scrolls, World of Warcraft, EverQuest, Star Wars: The Old Republic, Ultima, Eve Online, and even Nintendo’s The Legend of Zelda. With over 10 million subscribers by itself, World of Warcraft, or WoW, is as popular as some of the biggest shows on television. This is not to ignore D&D’s impact on other video game types, most notably first-person shooters. John Carmack and John Romero largely created this monstrously successful genre of video game with their release of Castle Wolfenstein and their subsequent release of the legendary Doom. Notably, Carmack and Romero were prolific Dungeons & Dragons players, and one need not look far in their games to see D&D’s proverbial fingerprints all over them, whether it be the dungeon/maze element to their design, the monsters that you fight, or even the gaming aspects of first-person character assumption. With millions of copies sold for some of the larger franchises, first-person shooters have, so far, been the games of the 21st century. Titles such as Call of Duty, Halo, and Medal of Honor control a massive share of the video game industry—a trend recently demonstrated by the release of Activision Blizzard’s multiplayer online first-person shooter Destiny. The game achieved over $325 million in sales in its first five days—a feat rarely if ever accomplished in any established form of entertainment. Sharing their technological infrastructure with multiplayer online games, massively popular virtual worlds, such as Second Life and Habbo, would also have lacked the foundations for development without D&D. The entire concept of developing a character and assuming an “avatar” has its origins deeply rooted in the earliest role-playing games. The extraordinary successes of the Lord of the Rings movie trilogy and the more recent Game of Thrones television series are but a couple of examples of how inundated popular culture has become with the formerly esoteric world of fantasy. To be sure D&D did not create the fantasy genre, but it certainly popularized it in a very personal way that not only bolstered its audience but also multiplied its creators and innovators. Who or what was carrying the fantasy torch through the 1970s, ’80s, and ’90s? Who was providing the fundamental structure for fantasy characters, settings, and plots? According to RPG scholar Michael Tresca, “Dungeons & Dragons acted as a translation of sorts for the fantasy genre.” D&D, and RPGs in general, provided a new level of personalization for these worlds. It created an atmosphere of do-it-yourself fantasy and science-fiction storytelling that, according to Jay Little, designer of Fantasy Flight Games’ Star Wars: Edge of the Empire Roleplaying Game, “created a new way for fans to interact with fantasy literature and culture.” Now anyone could be part of the story. Regarding D&D’s influence on technology, Adam Rogers, an editor at Wired magazine, contends, “Mr. Gygax’s game allowed geeks to venture out of our dungeons, blinking against the light, just in time to create the present age of electronic miracles.” And so they did. It wasn’t the jocks or the prom kings and queens who created the social and business infrastructure of the 21st century. It was the geeks and the nerds who spent their Friday nights playing with their computers and Saturday nights playing a little D&D with their friends. In this way, D&D filled an important social gap for those less inclined to mingle. Providing camaraderie through D&D and its role-playing offspring might, in fact, be D&D’s greatest legacy. “It founded a means for socially awkward people to socialize,” said early TSR employee and Dragon editor Tim Kask. To these people, D&D gave companions—not just friends but fellow adventurers, sharing dangerous journeys and exotic quests. The bonds built between fellow gamers are indeed unique. Not only do they share imaginary adventures and a fair share of make-believe peril, but they reveal facets of their personalities that most mainstream friendships would never see. How many modern friends can say that together they have stormed dungeons, slain dragons, and been brought to the brink of death and back countless times? Though these experiences are imaginary, they are derived from a part of each gamer’s personality, a part that most people would never let anyone see—the dreamer inside. These unabashed and unashamed group imagination exercises no doubt form the basis for deep and long-lasting real-life relationships. But the social legacy of D&D reaches even the mainstream avenues of online social networks and social media. Shortly after Gary’s death, Wired’s Adam Rogers wrote, “Gary Gygax died last week and the universe did not collapse. This surprises me a little bit, because he built it.” He goes on to credit Gygax and D&D with laying the foundation for “the social and intellectual structure of our world.” And while it may be far-reaching to ascribe all things social media, and indeed their success, to Gary Gygax and Dungeons & Dragons, it is important to acknowledge that these technologies use concepts and platforms that were originally unique to RPGs. Drawing their lineage from early online networks including RPG-based multiuser dungeons, sites like Facebook, Twitter, and Google+ require participants to build a unique persona—a character—that will be “played” by its user. As I believe most would acknowledge, this persona is part real and part imaginary—effectively, the side created for public presentation. Any gamer could tell you that is or her RPG characters are just that: a component of his or her personality or intellect that is given life by the character. So while tabletop D&D may never be a fully mainstream activity, its influence has brought about a very mainstream cultural shift. Through video games, fantasy films, social media, and other modern technologies, D&D-inspired concepts have subversively infiltrated our society—the world has gone geek. Excerpted and adapted from Empire of Imagination: Gary Gygax and the Birth of Dungeons & Dragons by Michael Witwer. Out now from Bloomsbury.